In preparing materials for our weekly "Ask A Realtor Workshop", I was turned onto a book by Rob and Joanne at Alma Libre Bookstore here in Puerto Morelos. 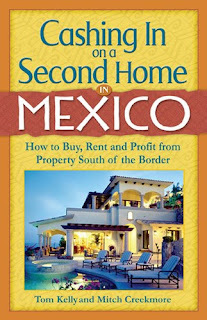 Cashing In on A Second Home in Mexico, written by Tom Kelly, is an excellent resource for those seeking good information about investing in Mexican Real Estate. It does a great job of simply explaining the purchasing process, the costs and time involved, and good tips for foreign investors to be aware of when in a Mexican real estate transaction. In addition, it highlights some up-and-coming investment areas in Mexico and discusses U.S./Canadian tax break possibilities for investors. They have plenty of copies at Alma Libre -- I encourage you to pick one up if you are considering purchasing. Have questions about purchasing or just interested in how real estate ownership works? Join us every Tuesday at 5 p.m. for our "Ask a Realtor Workshop"!